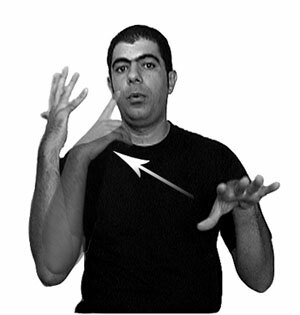 A major project of The Sign Language Research Lab is the investigation of a new and isolated sign language that arose in a Bedouin village located in Israel. Al-Sayyid Bedouin Sign Language (ABSL) offers investigators Wendy Sandler (UHaifa), Carol Padden (UCSD/CRL), Irit Meir (UHaifa), and Mark Aronoff (SUNY-Stony Brook) a rare opportunity to trace the emergence of a language almost from the beginning, and to discover its essential ingredients. The project, conducted in cooperation with the Center for Research in Language of UCSD, is documenting and analyzing the language, and comparing its development across generations of signers. Working together with people from the village, the team is also creating a dictionary of Al-Sayyid Bedouin Sign Language. For more on this project, including links to research papers, click here. (dubbed superarticulation in this work) plays a role similar to that of intonation in spoken language, and its patterning in the language are a major focus of this project. 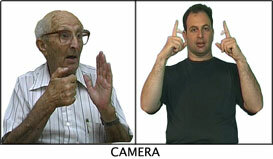 Taken together with the similarities, interesting formal differences between the intonation of spoken language and the superarticulation of sign language are offering the researchers a new perspective on the relation between the phonetic basis of language, its phonological organization, and its communicative content. beginning about 70 years ago, it provides a natural laboratory for investigating language formation and language change. The project is systematically investigating the language of four generations of signers, each of which contributed to the development of the full contemporary system. Examining the course of development of specific structures in this language is expected to shed light on the ways in which a linguistic system comes into existence, and how it develops as the language matures. theory can encompass a system that is grammatical, but different in some ways from verb agreement in spoken languages. 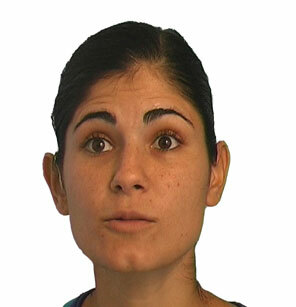 By applying a particular componential analysis of verbs in ISL, a model is developed which can predict the agreement pattern of each verb in the language, and at the same time can pinpoint the similarities and differences between the spatial predicates of ISL (and sign languages generally) and the auxiliary and verb systems of spoken languages. 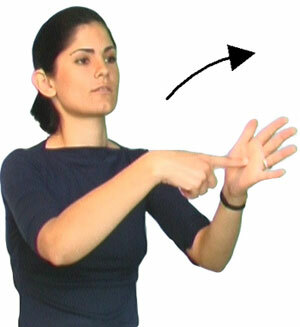 A model of sign language morphology: the effects of modality and of language age. kind that is rare in sign languages. Properties of the former are attributed to modality, and of the latter to the youth of sign languages, identifying interesting grounds for comparison with creole languages. The research described on this web page has been supported by The Israel Science Foundation, The United States-Israel Binational Science Foundation, and The National Institute on Deafness and other communication Disorders of the National Institutes of Health.